The first thing I saw when I was roused from my third nap yesterday was Susan (the rabbit) hopping frantically by my nose in an attempt to gain my attention. I sat up with a yawn and a sneeze (something she was not too fond of) and asked what was so important. Susan (the rabbit) hopped up onto my belly and placed her front paws around my muzzle. I had to sneeze again, but the sheer look of terror in her eyes subsided the urge. I did not want to upset her any further. There was a long moment of silence as Susan (the rabbit) tried to gather her thoughts. Something was important enough to wake me, and whatever it was had petrified her. In the gentlest tone I could muster, I asked what was wrong. Why was she so scared? Is a third nap really a nap if it lasts longer than four hours? Or at that point is it just sleep? Susan (the rabbit)’s voice quivered. “There are foxes,” she squeaked. She seemed to not have a response to my questions about naps. I continued my line of questioning by asking: What sort of boxes? Was there food in said boxes? Could she take me to them? Does she require assistance in transporting the boxes? Can the boxes be napped upon? This, of course, was no revelation to me. I was quite aware of the presence of foxes in the forest, albeit I have never met one who was in a non-carcass form. I am certain that non-carcass foxes are far more interesting (and certainly more lively) than their carcass counterparts. Because of the possibility of meeting a non-carcass fox, Susan (the rabbit)’s claim piqued my interest enough for me to postpone my third nap until it was time for a fourth nap. I got up, stretched my paws, and started out of the cave when Susan (the rabbit) hopped in front of me. I asked her why she was stopping me. I told her that I was well aware of this and that she had already said as much. “You don’t understand, bear,” Susan (the rabbit) shook her head grimly. Apparently, I did not. Susan (the rabbit)’s limited information and/or vocabulary did not quell my curiosity. If there really were foxes beyond my cave walls, I wanted to meet them. I would love to discover what they did for fun, what it is like being orange, how it feels to not be a carcass, etc. Despite her request, I strolled past Susan (the rabbit) and headed out of the cave and into the forest. I expected to see a dozen or so black-tipped tails wagging in anticipation to meet me, but I was only met by Francis (the coyote) sitting on his haunches. His eyes were closed as he gave the air exploratory sniffs. I decided to join him and began to smell my surroundings. This went on for a few minutes before we said hello to one another. I heard a fretful squeak behind me as Susan (the rabbit) hunkered down behind my rear legs. I told him yes and stepped aside so Francis (the coyote) could see where Susan (the rabbit) had gone. Francis (the coyote)’s reddened muzzle curled up into a bright smile. Clumps of white fur fell to the ground as he did so. I asked him where all the foxes were. Had he scared them away? I still wanted to meet one. “No foxes out here,” Francis (the coyote) said. “Just me.” His smiled widened, exposing a series of yellow teeth speckled with crimson. Bits of bone protruded between them. He must have just eaten lunch. I turned to Susan (the rabbit) and told her there were no foxes. There was just Francis (the coyote). I explained to her that she could have easily mistaken him for a fox, though. 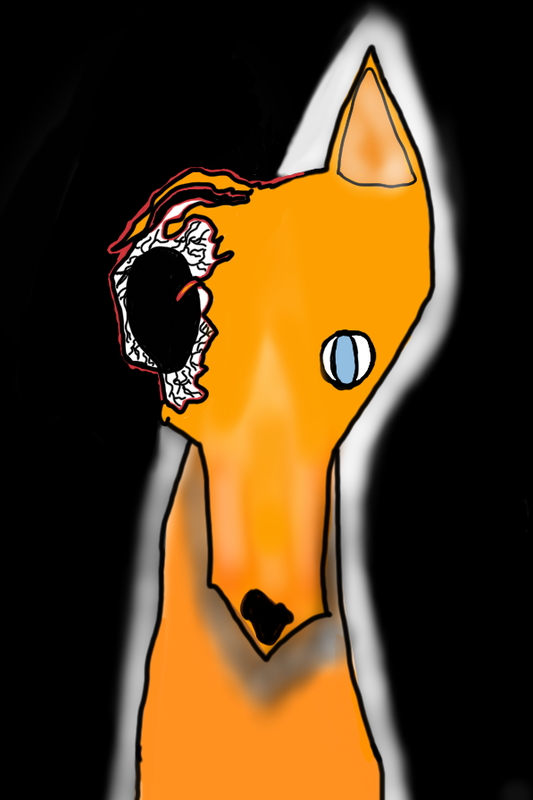 The red mess on his face mixed with the bit of white fur gave his head a lovely, orangey hue. Susan (the rabbit) suddenly bit my nose and hopped away into the forest. Francis (the coyote) followed her. I shouted a goodbye to the two of them. Hopefully, they enjoyed the rest of their day together. I plopped down in the dirt by my cave to contemplate my nap schedule for the rest of the day, when a wave of disappointment washed over me. I wished there had been foxes. They seemed like wonderful creatures. Suddenly, a second emotion swept away disappointment in what I can only describe as not-happiness. What if there have never been foxes? What if they were carcasses and nothing more? Does being a carcass make them less fox or, in some terrible way, more fox? Is there some way to discover if I will become more or less of a bear when I am no longer moving around? Will there be a breakdown of the very fiber of my bearness on a molecular level? Will my bearness transcend this plain of existence and arrive where there might be non-carcass foxes? When will I meet foxes? There was no way to really tell, so I decided to sniff the dirt by my cave for awhile and then take another nap. I still do not know why Susan (the rabbit) bit me. You can read more bear thoughts by clicking these lovely blue words. This entry was posted in Bear thoughts and tagged bears, coyotes, foxes, happy thoughts, humor, nature, oblivious, thoughts on March 30, 2015 by A bear.